How does TOPS define destruction? El Chete. This blade was designed with one thought in mind... chopping. With a 1/4" thick blade that is a full foot long, it will do that very well. Even though it's so large, the knife still weighs in under 2 pounds. 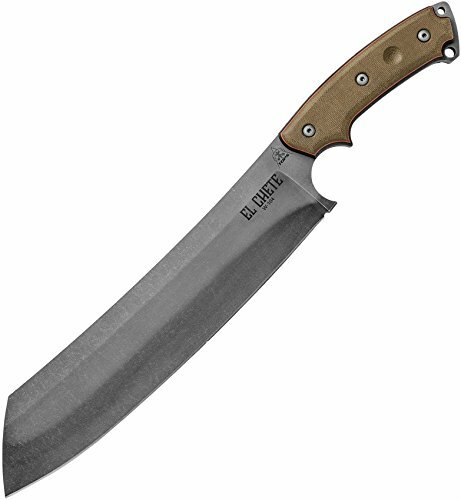 El Chete is the first TOPS knife to be released with our wicked new finish called Acid Rain. Because of the process we use, the finish varies slightly from knife to knife so that each person gets something unique. We wanted the handles to be thick enough to fill each user's hand like a hatchet or small ax handle would, so we decided to use sandwiched Micarta. It's well rounded for comfort and the black canvas Micarta underneath the green canvas Micarta adds even more to the aesthetics of this piece. The sheath is an out-the-front design with all the bells and whistles. You just pull up slightly then out the front so that you don't have to strain to pull the knife all the way up through the sheath. There is a strap that when snapped into place, helps immensely with the retention of the blade. If you're in the market for a large knife, you've definitely found it.